Renewables First’s sister company, GoFlo Screens, Highly Commended in Energy Efficiency Awards Scheme. 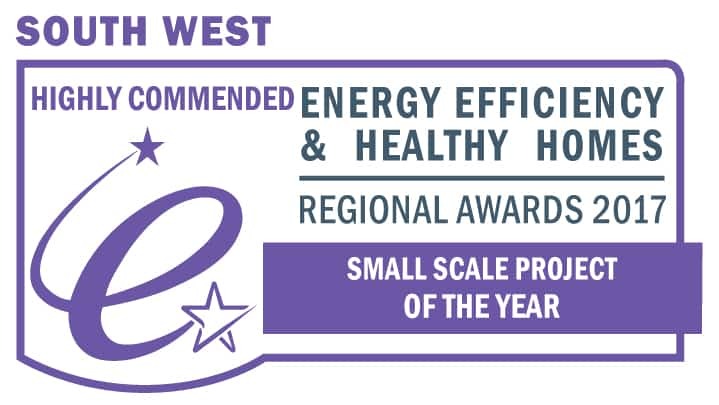 GoFlo Screens Ltd was recently “Highly Commended” within the Small Scale Project Of The Year category of the Energy Efficiency & Healthy Homes Regional Awards 2017. The award relates to the design, supply and installation of its innovatively designed self-cleaning water intake screen at the Kenningstock Mill 25 KW hydropower scheme. The project involved the design, supply and installation of an effective automated water intake screening system. This supplemented a hydro refurbishment project (undertaken by Gloucestershire-based, Renewables First), which routinely experiences river debris partially blocking the inflow of water. The site required fine screening (2 mm) to comply with fish and eel regulations. The efficiency of the new screening system at Kenningstock Mill hydro project, Camelford, Cornwall, affects a renewable energy yield improvement of 21,490 kWh per year, equivalent to meeting the annual electricity needs of approximately 5 British homes. All suppliers were local to the South West Region. Screen manufacturer GoFlo, and panel suppliers, Stroud Switch Gear, alongside A.D. Taylor Fabricators, are all based in Gloucestershire. The civil contractor, Mark Andrews Ltd, and electrical contractor, John Wood Electrical, are based in Cornwall. The Kenningstock Mill hydropower scheme, installed by Renewables First (sister company of GoFlo Screens Ltd) was recently retrofitted with a GoFlo self-cleaning travelling water screen, as a way to significantly reduce the time associated with screen debris management, given that the hydro site location is prone to water debris from nearby tree cover. As well as massively reducing maintenance time, the self-cleaning water intake screen will also optimise the rate of flow to the hydro turbine, thus increasing turbine output and income generation. Indeed, the screen affects an efficiency improvement for the hydro-system of approximately 20% more renewable energy. The travelling water screen was manufactured and installed by Gloucestershire based, GoFlo Screens Ltd. The installation comprises one screen unit with a width of 0.9 metres and a length of 4.1 metres. The screen is equipped with a fine mesh in order to protect fish and comply with environmental regulation. The screen is designed to accommodate a maximum flow rate of 0.6 m2 per second. The unit was designed to fit into the already up and running Kenningstock Mill hydro scheme, which comprises a 25 kW Crossflow turbine.